You may have already heard of “Bollywood” beads, but until you see them in person and feel the texture and the beautiful craftsmanship, you can’t fully appreciate them. I have always shied away from beads that seemed too “ethnic” or that seemed to “heavy”. But when I was contacted by Maruti Beads and read about the Maruti, Kashmiri and Lac antique craft tradition, I was intrigued. Kashmiri beads are made from a mix of marble powder and manufactured resin (polymer clay). Maruti Beads are artistic blends of Kashmiri beads with silver plated side caps in a one of a kind creation exclusive to Maruti Beads. Lac beads are made from a mixture of Lac and marble powder, ornamented with silver plating, seed beads and rhinestones. Lac is a hard resin which is a natural secretion from a little bug called Kerria Lacca which dwells in the twigs of host trees. In India during ancient times, gold and silver jewelry was worn only by the Maharaja or the royal classes. As a result, wearing jewelry became a symbol of prosperity and beyond the means of the common people. Lac originally a fragile element, was harvested and through a slow process of heating was made malleable and made into beads and used for ornamentation . All citizens were able to decorate and adorn themselves showing off their personal beauty. The making of the beads is an ancient art form passed down by craft masters through generations. Each of the Maruti , Kashmiri and Lac beads are hand decorated with a variety of materials for ornamentation such as mirror chips, seed beads, silver plating, rhinestones and some of the more beautiful ones are adorned with gemstones. Although they are made in series and collections of like color and shape, no two are precisely the same, giving a unique quality to every piece you make with them. With the decorative chips and rhinestones I thought they would scratch and pinch, but this is not the case at all! I am quite pleased to find that even after wearing a fully beaded choker necklace I didn’t have any type of scratches or irritation. 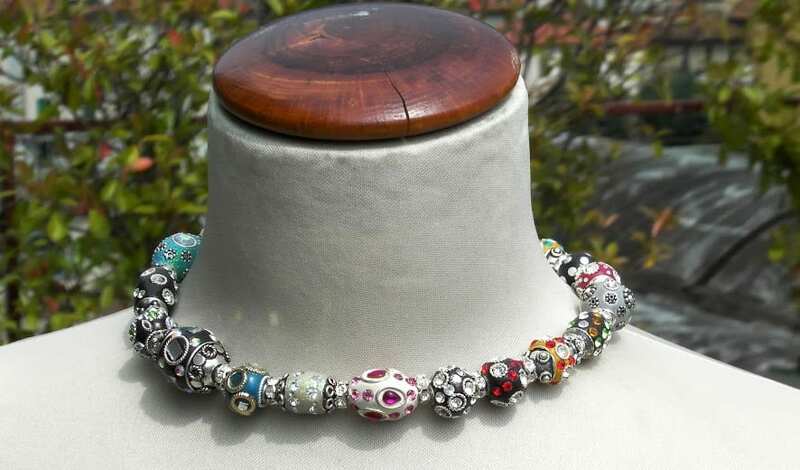 If you are or your customers are sensitive to silver or base metal you should only use the Kashmiri beads and Lac beads which don’t contain metallic embellishments. Another thing I found quite pleasing was that the beads are not heavy. They are bold and colorful without being weighty. The polymer clay and lac based beads are light, yet substantial. Maruti Beads is based in Rajasthan, India and was established in 2002 making quality hand crafted Maruti, Kashmiri & Lac beads. In 2004 they started exporting and now their products are found all over the world. Maruti Beads has a select team of master craftsmen who individually handcraft the products at the Maruti Beads artisan’s studio and are monitored for quality control on the premises. Maruti Beads designs range from traditional and ethnic to contemporary styles, as well as custom made lines. They not only have Maruti, Kashmiri and Lac beads but also Copper beads, and glass beads, as well as finished products bracelets, bangles and earrings and necklaces. One of their hot items and latest trends is the Shamballa bracelets inspired by Shamballa beads used by Buddhists monks during meditation to maintain calm. Each color represents a chakra and personality trait. Click here to learn more about Shamballa bracelets . You can order beads to make your own projects or ready- made items at http://www.marutibeads.com/. You don’t need to be a wholesaler but there is a minimum order of 60 dollars. The shipping is very fast and the beads are well packed and protected in plastic casing. I was very happy to try the Maruti beads products. I found the staff very helpful, the shipping well done, and the beads are easy to work with both in practical as well as creative terms. With their bright colors and sparkling effects, they are quite easy to fall in love with.